Shared values and a passion for creating a sustainable future for all is the driving force behind a new partnership for Nelson Mandela Metropolitan University (NMMU). 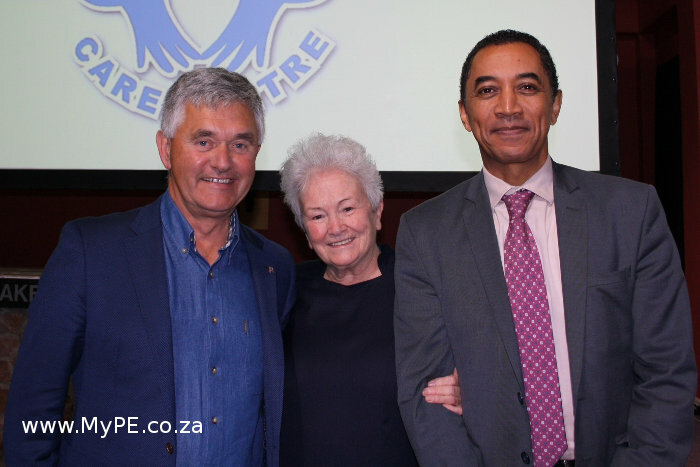 The Eastern Cape University has committed to supporting the Missionvale Care Centre, started from humble beginnings by Irish nun Sister Ethel Normoyle almost three decades ago, and now offering some 25 000 people in the community access to health, wellbeing and educational services. “Our University pledges its full cooperation and support in taking the Centre to the next level. We’d like to take the University on the hill [down] to the valley among the people,” NMMU Vice-Chancellor Prof Derrick Swartz shared at the strategic plan launch for the Centre last week. The University’s Missionvale Campus overlooks the Care Centre and surrounding community, who live mostly in self-built homes that lack basic amenities. The Centre’s strategic plan to create a sustainable community through capacity building, includes efforts to harness new resources and forge partnerships with agencies, donors and specialists in the field of education, youth and community development, healthcare and entrepreneurship. As a result of its shared values and commitment towards sustainable self-development, NMMU has volunteered to be one of these partners. NMMU has offered its expertise – and energy – in the fields of education, agriculture, social development, health sciences and ICT in a formal Memorandum of Agreement (MoU). “We must never forget about changing the life of an individual for which the caring, compassionate human touch of Sister Ethel is so well known. She’s an example to us all,” said Prof Swartz of the Centre whose ethos of respect, dignity and compassion resonates with that of NMMU. Apart from sharing knowledge and expertise in good faith for at least next five years, student learning and volunteerism has been included as part of the agreement. Students will be given opportunities to learn and develop skills as part of their curriculum. Business Development and Sustainability Planning Support: The University will explore a financial for the Centre; offer business development support for the Crafters Centre; identify and implement micro enterprises in the community and offer advice around logistics of the Centre’s business processes and operations. Teaching, Education and School Support: NMMU will seek to offer extra-curricular activities for the Missionvale Care Centre primary school children and broader community through a variety of options including learning and homework support through to teacher training and development. Career Counselling and Guidance: Support ranging from counselling and guidance for primary school children through to career guidance and training for Life Orientation teachers is being offered. Health Sciences: The range of support from the University’s Faculty of Health Sciences is extensive as NMMU is presently working on an innovative model to produce students who are properly prepared and educated to tackle South Africa’s particular health care needs. The support for MCC will be include upskilling and training for community health practitioners (home-based carers); manpower support for clinic activities (experiential learning/volunteerism); analysis to determine needs and intervention opportunities in the broader Missionvale community; nutrition education and assessment and various community development programmes linked to NMMU’s nursing students. Within the same faculty, the Human Movement Science students will be able to offer coaching and physical activities and introduce their PasSPORT to Health project, and the Emergency Medical Care students, first aid training. Agriculture: The University’s Agricultural students will be able to assist the MCC with their community food garden and other food garden initiatives in the greater Missionvale area. Information Technology and Connectivity: Plans are already underway to support Wi-Fi connectivity and back-up to the Centre, along with systems development and programming, and implementation and training. Skills Development and Training: NMMU will be able to assist in several areas dependent on the needs of MCC.